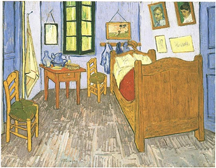 Vincent's Bedroom in Arles , by Vincent Van Gogh, painted in September, 1889, less than a year before his death. The painting exhibits the distortions characteristic of many of his works. These particular distortions are similar in some ways to the distortions we see in images produced by the cameras used in many computer-based video communications systems. Although the video distortions have a variety of psychological effects, depending on the precise nature of the distortion, the effects are more significant when the viewer has never met the person viewed. The viewer forms impressions that don't actually fit reality. And many of us are uncomfortable about our images as represented in these systems. This complexity creates what might be called "video risk," which appears as an elevated probability that people might not understand each other. Enhancing image fidelity by employing up-to-date and high-quality equipment might well be worth the cost. Image courtesy VanGoghGallery.com. For teams, creative conflict is essential to high performance. It helps them find solutions that no team member could have developed alone. But not all conflict is creative. Some is destructive, or toxic. In creative conflict, people might contend about each other's ideas, but they do so respectfully, often with humor and fun. In toxic conflict, they contend with each other about each other, disrespectfully. Even when they're discussing each other's ideas, they do so, in part, to attack each other. And some attacks are purely personal. Any team can fall into toxic conflict, but virtual teams are most at risk, and they have more difficulty healing. Here are some tips and insights for virtual team leaders who want to avoid or deal with toxic conflict. Virtual teams use communication channels such as email, video, telephone, and instant messaging. All are psychologically "half-duplex" channels — they let us focus on sending or receiving, but not both at once. Face-to-face communication, by contrast, is psychologically full duplex. We can and do make adjustments as we're speaking, according to our reading of the receiver's response. Since we can't do this in half-duplex communication, we send longer messages, often offending, ignoring, or hurting our partners. Keeping messages short lets you find out how you're doing in time to make adjustments. Because we see only those elements that can squeeze through our communication channels, toxic virtual conflict is less visible than is toxic local conflict. If toxicity is evident even from a distance, it's probably worse than an equally obtrusive toxic local conflict. probably acting too lateperceptions. What can safely be ignored in a local conflict might not be ignorable in a virtual conflict. If you wait before intervening to be as certain in a virtual conflict as you would be in a local conflict, you're probably acting too late. If you suspect a toxic conflict, don't wait passively for more information. Do whatever is necessary, including traveling to the remote site, to resolve the ambiguity between toxic conflict and creative conflict. When people know each other, they can make corrections for the deficiencies of their communication channels, because they have a reservoir of trust, and because they can take account of the effects of the medium. To trust each other, people must know each other. Face-to-face meetings are the only effective way to help them establish and maintain relationships. When we decide not to pay for face-to-face meetings, we're deciding to pay instead for the effects of toxic conflict. Would you like to see your comments posted here? rbrenCJZTOiIUHVlRADSnner@ChacxfjWKwxfwwwHAEPHoCanyon.comSend me your comments by email, or by Web form. To be "down in the weeds," in one of its senses, is to be lost in discussion at a level of detail inappropriate to the current situation. Here's Part II of our exploration of methods for dealing with this frustrating pattern so common in group discussions. See also Personal, Team, and Organizational Effectiveness, Conflict Management and Virtual and Global Teams for more related articles. I offer email and telephone coaching at both corporate and individual rates. Contact Rick for details at rbrenjbTLywwqfanHaSYYner@ChacKptTnjCRVmOVssDeoCanyon.com or (650) 787-6475, or toll-free in the continental US at (866) 378-5470.